Amphenol Industrial Operations’ (AIO) eight decades of experience has established it as a leader in manufacturing interconnect systems for applications in adverse environments. Applications in the mining industry require sophisticated, precision engineering and AIO has the manufacturing capabilities to meet that need. AIO continually innovates, offering customers its RADSOK® contact technology, which can provide up to 50% more current even when using the same size pin. Connectors using RADSOK® technology easily outperform similar products on the market. The mining industry faces significant challenges in obtaining sufficient supplies of electricity. Modern mines and mining equipment use greater amounts of power and must be able to manage higher voltages, transmit data faster and operate continuously even in remote and harsh environments. AIO offers mining operations its wealth of experience in the interconnect industry and an extensive portfolio of design, manufacture and innovation. Over the company’s 80 years of operation, AIO has developed the know-how to solve any technical challenge, whether it’s a new connector design, an over molded or mechanically terminated cable assembly, complex harness, or complete electrical packaging solution. AIO’s MVC cable coupler with Rapid-Couple® technology is the best interconnect for demanding jobs. Mine sites depend on electrical equipment and the hazardous nature of the industry means that it is essential to ensure the safe and reliable transfer of electricity throughout a site. The MVC cable coupler incorporates patented RADSOK® contact technology to offer an amperage of up to 25% higher than a standard contact, as well as a lower T-rise, less resistance and reduced mating forces. The MVC is engineered to AIO’s stringent standards for ruggedness and reliability, so it can withstand any field condition in the world. The company’s Rapid-Couple® interlock method ensures quick and easy mating and unmating, which also provides a secure fitting that repels water and soil to keeping the contacts uncontaminated. The Amphe-Mine EX range is a hybrid derivative of the parent Star-Line product series. The Amphe-Mine EX series holds many certifications for hazardous area classification, including ATEX, IECEx, AEx, Canadian EX and GoST-R. The latest Australian Group I Mining certification is through TUV Rheinland and meets the IECEx listing for Group I applications in Australia. ePower series connectors are ideal for the mining industry as they are designed for the demanding requirements of hybrid, electric vehicle, mining and heavy equipment markets. ePower connectors operate at 800V to 1,000V with an amperage rating from 200A to 500A. Using RADSOK® technology, ePower offers up to a 40% smaller footprint than three EMI shielded cable glands used in the same end application. NEPTUNE® products incorporate AIO’s time-tested Star-Line family contact technology. The NEPTUNE series offers customers a significant improvement over existing power connectors on the market today, with its weight, space and mounting footprint reduction. UL® Listed amperage ratings include 30, 60, 100, 150 and 200 options, with three and four contact options available. NEPTUNE has a large degree of mounting flexibility with its complete arrangement of back-shells. From straight plugs and panel mount receptacles to inline receptacles and angle mounting options, NEPTUNE provides an array of options that were previously missing from the market. The Rig-Lok is a reverse bayonet connector which incorporates AIO’s patented RADSOK® technology and is designed to deliver high power from source to load. The plug has an 18mm RADSOK socket and the receptacle contains an 18mm pin with the option of crimp, two-hole busbar or a threaded busbar termination. When unmated, the touchproof, dead-front contact design ensures that personal safety is maintained. The RADSOK’s low milli-volt drop and minimised temperature rise when transmitting high current makes it a preferred choice over alternatives. Amphenol Industrial is a division of the Amphenol Corporation. The leading global manufacturer supplies cylindrical connectors as well as rectangular, standard miniature, fiber-optic, EMI/EMP filter and a range of special application connectors. 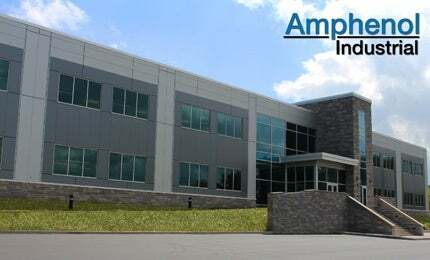 Amphenol Industrial has a 675,000ft² cutting-edge manufacturing facility at Sidney, NY, which is ISO: 9001 certified and qualified to MIL-STD-790 requirements. The company’s manufacturing capabilities include state-of-the-art CNC machining, die-casting, molding, impact and extruding, plating, screw machining and process controls. AIO also has a fully equipped material evaluation lab and an engineering support organisation with the latest computer aided design software and analysis tools. Amphenol Industrial Operations manufactures interconnect systems for applications in adverse environments. Amphenol produces interconnectors for mining and heavy industries. The Amphe-Mine EX series is a hybrid form of the parent Star-Line product line. The ePower series of connectors is designed for the demanding requirements of hybrid, electric vehicles and utility truck electrical systems operating at 800vdc to 1,000vdc with a 200A to 500A rating. Flex circuits and rigid flex can be used to improve the reliability, design flexibility with 3D configuration, the weight and size to the total electronic package. Designed with MIL-DTL-5015 insert patterns in mind, this circular reverse bayonet connector has roots in the military market. Amphenol Industrial Operations introduces its ruggedised M12 high-speed data connector, the Max-M12. Amphenol Industrial Operations (AIO) offers many products and solutions for the mining market. A hazardous industry by its very nature, mine sites must rely heavily on electrical equipment. The safe and reliable transfer of electricity throughout a site is a significant concern. Amphenol Industrial Operations introduces a new UL® listed power connector family. The new NEPTUNE® connector series is designed to perform in the most demanding environments. Amphenol miniature cylindrical connectors offer twice the number of contacts in just half the size of a standard connector. Amphenol Industrial Products Group (AIPG), which has been manufacturing connectors for more than 80 years, offers an extensive array of connector lines including rectangular, circular, fiber optic, EMI / EMP filter and a variety of special application connectors. The modern mining industry requires vast supplies of electricity to meet the demands of production targets and remote location challenges. Amphenol Industrial Products Group proudly introduces a new line of heat shrink tubing for the electronics, energy, rail mass transit, heavy equipment, hybrid / electrical vehicles, telecommunications, mining and oil and gas markets. Amphenol Industrial Products Group now offers an explosion-proof, heavy-duty, hazardous rated connector series that provides outstanding performance in automated process control and instrumentation systems. Amphenol Industrial now offers a heavy-duty connector series for size eight and size twelve power contacts. Amphenol Industrial Products Group, a global leader in interconnect systems, offers a heavy-duty connector series that is explosion proof and certified for use in IECEx group one mining hazardous locations. Amphenol Industrial Global Operations, a global leader in interconnect systems, introduces a new line of heavy-duty medium-voltage couplers (MVC) for use in harsh environments. Amphenol's MVC series is ideal for applications in the mining, utility, tunneling and shore power industries for safe and reliable transfer of electricity throughout a job site.